Cats on leashes are welcome! The American Museum of the House Cat is now open, where you can see Dr. Harold Sims's 30+ year collection of all things relating to the House Cat. The collection includes: Fine "picture art" going back to the late 1800's, modern art, folk art, rare advertising art, cat poster art, art glass cats made by the finest glass makers of the world, vintage and antique toy cats, many of which are automations from the 1890's, vintage advertising, where cats are used to sell items, advertising clocks and storefront or window display items, etc. There is not another private collection of this magnitude and value in America. . The Catman2 no-kill cat shelter will be here far into the future and it and the public will benefit from the museum. 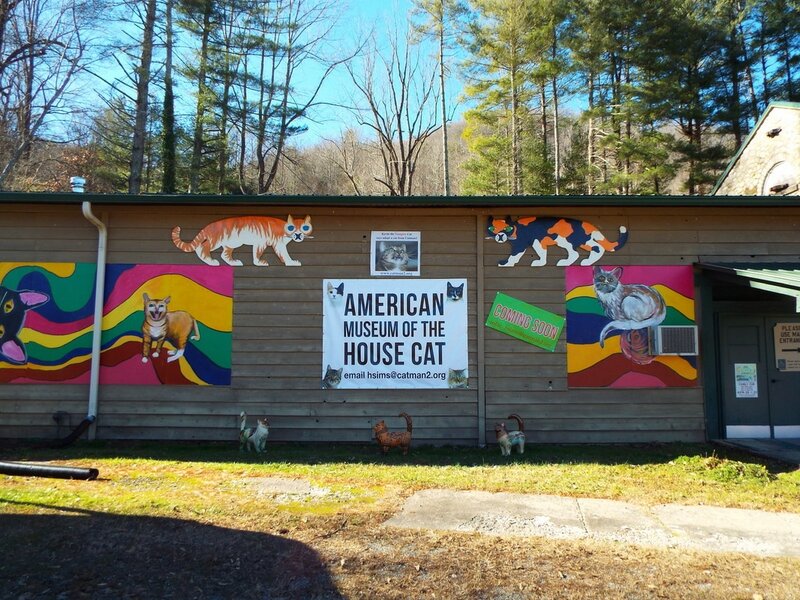 There is room to grow of this small prototype and “The Museum of the House Cat” could become a major attraction in Western NC helping to support the shelter and attracting visitors to the area. The museum location in Jackson County is at: The Gateway to the Smokey Mountain National Park, the nation's most visited park on a major highway (US 441) leading to Atlanta GA to the south, and to Cherokee, Harrah’s Casino, Pigeon Forge and Gatlinburg TN to the north. It is less than an hour’s drive from Asheville, NC with an international airport and a connection to other interstate highways intersect. The museum helps the cat shelter by providing funding for Catman2 to provide discounted spay/neuter services to the local community. The museum is self-guided, operated by volunteers, and accessed through the Antique Mall. There people who operate the mall will: take donations for the museum, sell any antique items donated, as well as published and other items marketed by Catman2 Inc.